Turn right to remain on Forest Road 28, signed "2800"
Forks and intersections are noted above where the route may be unclear, but additional side roads branch from the route. A trip meter is helpful in gauging the distances noted. Beware of potholes, muddy conditions, and steep drop-offs along unpaved sections of road. Mount Zion’s signature feature is its abundance of Pacific, or coast rhododendrons (Rhododendron macrophyllum), which reach tree-like stature and brighten even the shadiest woodland stands with masses of springtime blooms. Mount Zion Trail, June 15, 2016. 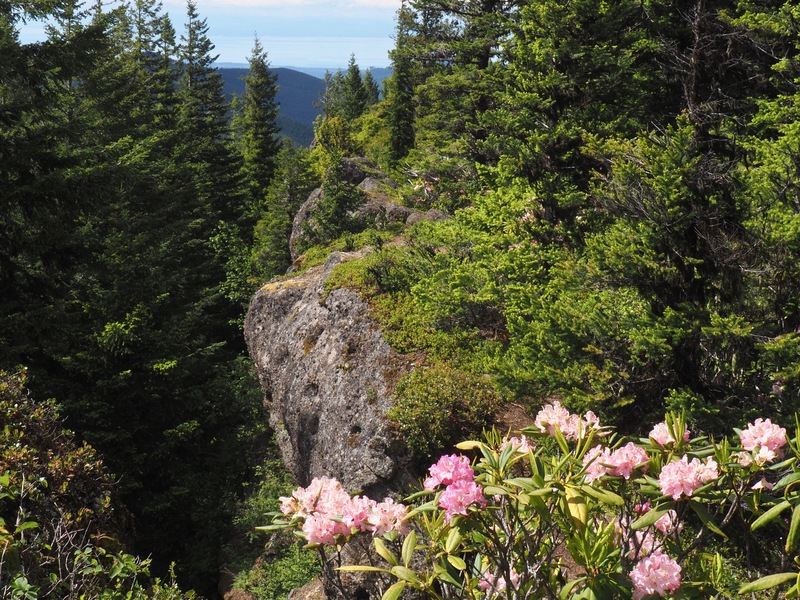 Mount Zion is known as one of the premiere trails for viewing Washington’s state flower, the Pacific, or, coast rhododendron (Rhododendron macrophyllum). During the late mountain spring, typically from mid-May to mid-June, the rhododendrons’ luscious blooms line the path from trailhead to summit. The trail climbs moderately to steeply through dense, second-growth forest recovering from past wildfires. Although new forest has nearly reclaimed the view from Mount Zion’s true summit, two short, roughly quarter-mile/0.40-km bootpaths branch from the summit and lead to better views along the craggy ridgeline. 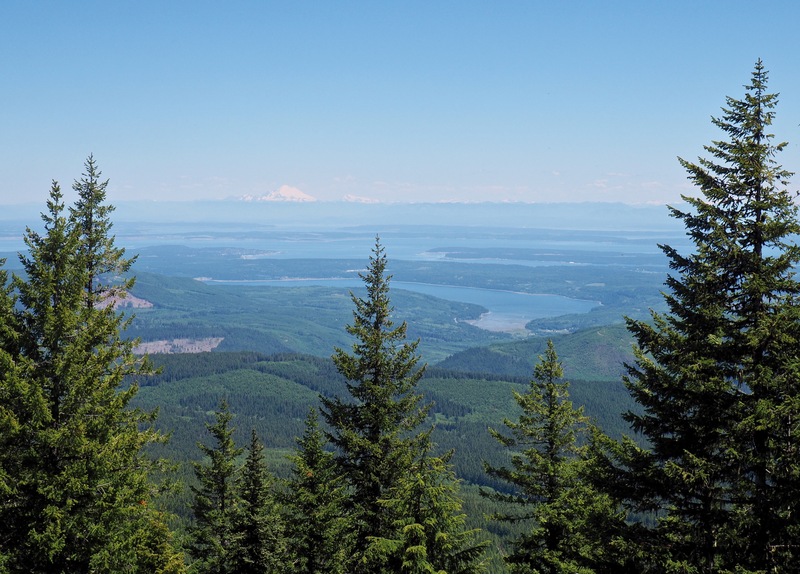 The left fork leads northwest along a precipitous ridge to peekaboo views across the distant, island-dotted Salish Sea to the snowy Cascades topping the horizon beyond, while the right fork leads southeast to a commanding view of Mount Townsend. Including the ridgetop side trails, the overall round-trip distance is just over 5.00 miles/8.00 km. 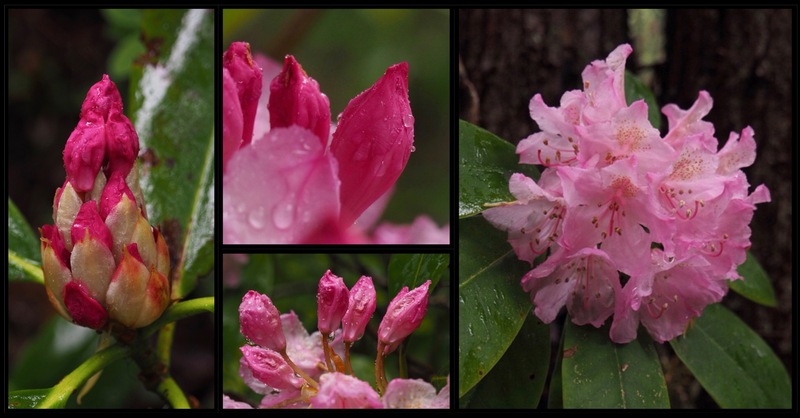 Although the rhododendrons steal the show during their bloom season, the moist woodland hosts a number of other unusual wildflowers to be found in the park-like wayside. As one might expect, the trail is quite popular when the rhododendrons are in bloom, although it is much less visited on week days. Furthermore, the Olympic Peninsula’s abundant precipitation can be a blessing in disguise, providing opportunity to enjoy a bit of rainy day solitude among the blooms. Given Mount Zion’s relative remoteness, no sounds of civilization mar the tranquility. Mount Zion’s trail zigzags upward beneath close, lichen-draped forest until it reaches the summit. Mount Zion Trail, June 15, 2016. Just beyond the trailhead, the path ducks beneath a bower of Pacific rhododendrons (R. macrophyllum), which are constant wayside companions throughout its length. Mount Zion Trail, June 15, 2016. Banks of rhododendrons (R. macrophyllum) bound the trail throughout its distance. Mount Zion Trail, June 15, 2016. From bud to bloom, the trailside rhododendrons (R. macrophyllum) lend an exotic air to the woodland shadows. Mount Zion Trail, June 15, 2016. At lower elevations where the rejuvenating forest is still in process of shedding excess growth, pinesaps (Monotropa hypopitys, a.k.a. Hypopitys monotropa) are abundant among the heavy litter. Lacking leaves and chlorophyll, pinesaps derive their common name from the former belief that they “sapped” nutrients from the pines and other conifers under which they grew. However, it is now known that they parasitize fungi in the soil around the trees’ roots. Mount Zion Trail, June 19, 2016. Coralroot orchids (Corallorhiza sp.) similarly lack leaves and chlorophyll and obtain nutrients from fungi in the soil by means of their knobby, namesake underground stems. Western spotted coralroots (C. maculata var. occidentalis) occur along the trail in both their standard, coppery form (top left) and their uncommon — and unspotted — yellow and white variation (C. maculata var. occidentalis fma. immaculata) (top right). 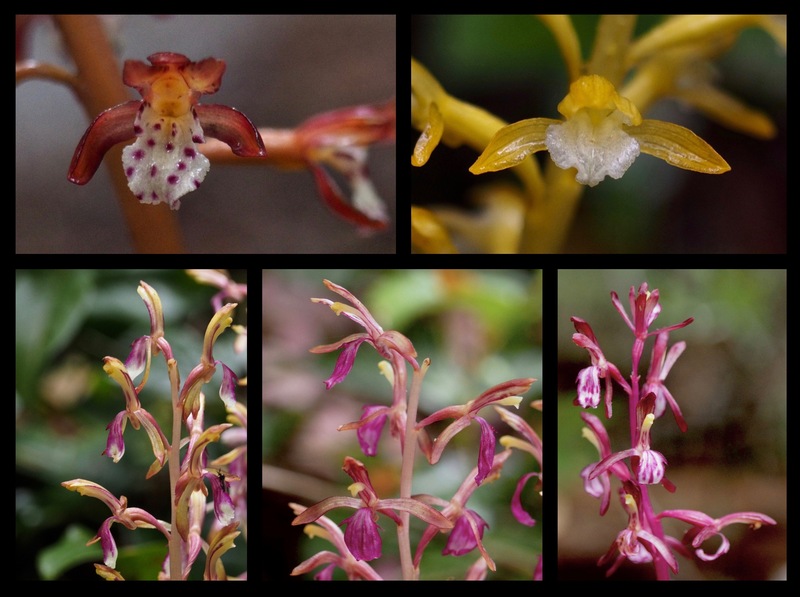 The Pacific, or, western coralroot orchid (C. mertensiana) (bottom) is also plentiful in a range of color variations, from minimally to almost fully magenta. Mount Zion Trail, June 15 and 19, 2016. 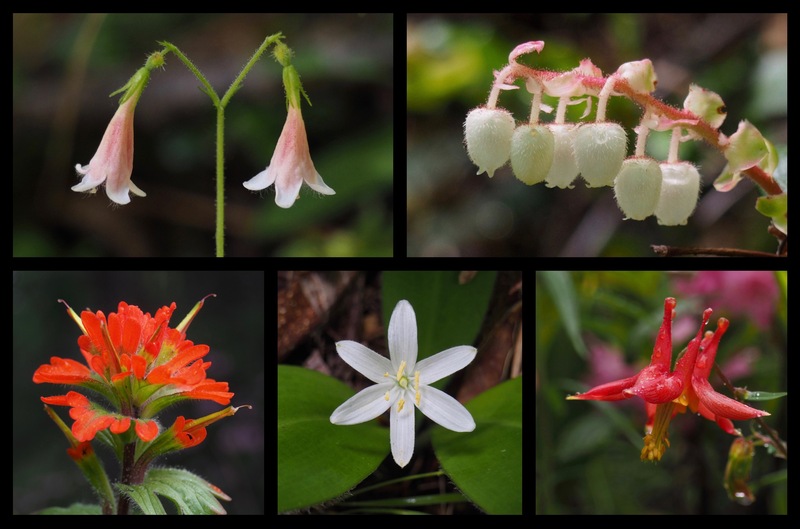 Many other wildflowers brighten the spring woodland, including, clockwise from top left, American twinflowers (Linnaea borealis), salal (Gaultheria shallon), western, or, Sitka columbines (Aquilegia formosa), queen’s cups (Clintonia uniflora), and harsh paintbrushes (Castilleja hispida). Mount Zion Trail, June 15 and 19, 2016. Although forest has reclaimed the nondescript summit, views still stretch across the treetops from the boot paths that branch on either side. The northeastern vista skims Admiralty Inlet and the many islands and peninsulas that pattern the Salish Sea, reaching Mt. Baker and Mount Shuksan capping the far-off Cascade Range. Mount Zion Trail, June 17, 2018. From the summit, the side trail to the left leads northwest along the brink of a rhododendron-lined precipice to limited views beyond. Exercise caution along this segment of trail, especially with small children. Mount Zion Trail, June 19, 2016. The left side trail ends on a slanted slab of rock that affords a sweeping view across the treetops to Bon Jon Peak, Little River Peak, and Mount Townsend crinkling into the distance beyond. Mount Zion Trail, June 17, 2018. The right fork of the trail leads to a stony outcrop that gazes southwest to Bon Jon Peak directly across the valley and on to Mount Townsend topping the horizon. Mount Zion Trail, June 17, 2018. 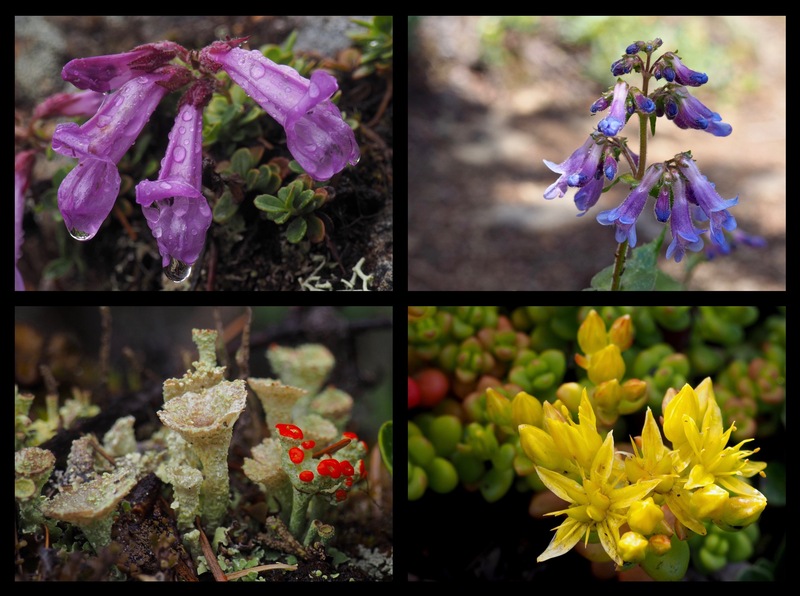 Even along the ridgetop, diminutive blooms cling to the stony outcrops, including Davidson’s beardtongues (Penstemon davidsonii) (top left), littleflower, or, pincushion penstemons (Penstemon procerus) (top right), spreading stonecrop (Sedum divergens) (lower right), and various lichens (here, likely a Cladonia species, which, although they do not “bloom,” produce sometimes colorful “fruiting bodies” that bear the spores of their next generation) (lower left). Mount Zion Trail, June 15 and 19, 2016. Even on an overcast day, clouds fleeting from Bon Jon Peak and the surrounding valley reward the intrepid hiker with their own magnificent display. Mount Zion Trail, June 15, 2016.